Ellie Phipps Price is a contributor to Writers on the Range, the opinion service of High Country News. She is president of the American Wild Horse Campaign and owner of Durell Vineyards in California and the 2,000-acre Montgomery Creek Ranch, a Northern California refuge for 240 wild horses. According to a recent poll, it’s a plan that 80 percent of Americans, including 86 percent of Trump voters and 77 percent of Clinton voters, oppose. But will Congress listen? Congress must reconcile the differences in spending legislation created by the Interior Department. The Senate version prohibits killing and slaughter; the House version allows it. But what was intended to be a wildlife protection law has been implemented by the agency in charge — the Bureau of Land Management — as if it’s closer to a pest-control statute that is designed to benefit ranchers who graze livestock on the public lands where wild horses live. Ranchers who hold federal grazing permits pay $1.87 per animal per month to graze their livestock on public lands. Compare that to the average fee on private lands in the West, which is over $22 per animal per month. It’s a sweet deal for ranchers, courtesy of U.S. taxpayers. BLM policy has long favored this special interest group, even though they represent just 3 percent of American ranchers and produce less than 3 percent of American beef. The path forward to protect wild horses exists, but to get there, we need to deal with some real-world facts. Wild horses are released back on the range in Nevada in 2017. Fact #1: BLM’s population limits for wild horses are not “appropriate;”; they’re extinction level. In 2013, the National Academy of Sciences concluded that the agency’s Appropriate Management Level was “not transparent to stakeholders, supported by scientific information, or amenable to adaptation with new information and environmental and social change.” Yet “getting to Appropriate Management Level” — a goal that is simultaneously unscientific and unattainable — continues to drive the agency’s unsustainable roundup and removal program. Fact #2: There’s room on the range for wild horses and burros. Privately owned livestock vastly outnumber federally protected wild horses and burros on public lands. 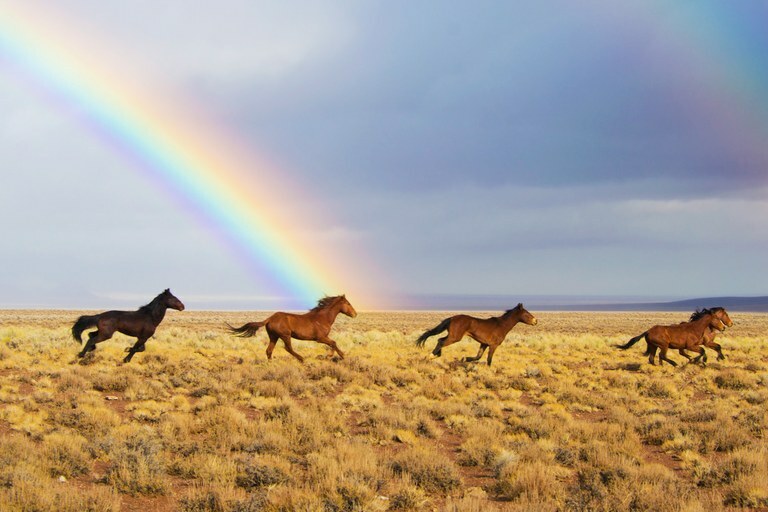 In Utah, for example, wild horses graze on just 2.1 million of the 22 million acres of BLM land grazed by livestock. In Nevada, ranchers have two-thirds of federal rangelands to themselves; in Wyoming it’s three-quarters. Fact #3: Slaughter is not a solution, but birth control is. Not only is slaughter politically untenable, it also won’t solve the problem. Slaughtering horses requires the BLM to continue rounding them up, which everyone agrees is unsustainable. Fortunately, a humane alternative is available. In 2013, the National Academy of Sciences recommended that the BLM use PZP fertility control to manage wild horses on the range. The vaccine is cost-effective, it can be delivered remotely by dart, and it prevents fertilization without affecting the horses’ natural behavior. Economic modeling shows that the agency could achieve its population goals and save $8 million in just one of 177 habitat areas by using fertility control. Despite this, the agency currently spends zero percent of its budget on birth control, promoting slaughter instead. It all comes down to this: Will Congress stand with the American people by rejecting the distorted “facts” voiced by a self-interested few? Will Congress force the Bureau of Land Management to pursue a humane and sustainable program, or will it allow the mismanagement to continue? The answer may not only determine the future of our wild horses, but also of the very public lands on which they live.